It's been some time since I've participated in IMWAYR, but after receiving/gathering/buying some amazing books at NCTE last weekend, this seems like a perfect opportunity to begin reading again. I will have to intersperse what I'm reading with what my students are reading since I already took a suitcase of books to school to share with my students last Monday, and we took a leisurely hour of reading workshop and did a book pass, previewing each book, and collecting titles they wanted to come back to when they had an opportunity. Based on what they recorded in their readers' notebooks, the books in the suitcase were a big hit!! The Shadow Throne by Jennifer Nielsen -- Thanks to Scholastic Press for sharing these and to Jennifer Nielsen for signing my Uncorrected Proof! The Ascendance Trilogy concludes. Once again, Jaron and his friends have to come together for a noble cause -- trying to save Carthya. This book is due out Feb. 25, so I don't want to include any spoilers for those of you waiting patiently/impatiently for the conclusion of this trilogy. I will say that the action remains fast-paced, and leaves you wondering if Jaron learned how to play chess at some point in his life; he is always thinking multiple moves ahead. Counting by 7's by Holly Goldberg Sloan -- this is the GREat Discussion book for our 5th graders and their parents. It is possible that I cried more this time than the first time I read this book. Closer reading with purpose in preparing for a book club conversation forced me to slow down and pay attention to some details I missed the first time. If it's even possible, I fell more in love with all the characters even more, especially Willow! I can't wait to have this conversation with our 5th graders and their parents. Flora and Ulysses: The Illuminated Adventures by Kate DiCamillo -- This is a book I heard many people discussing at NCTE, and I knew I needed to read it myself. So when one of my students was returning the library copy on Monday, I snagged it for myself (apologies to the rest of the school). Because of the author's name, I'm not sure what I expected, but I was pleasantly surprised. A mix of chapter book-like text interspersed with illustrations and graphic novel-like sequences made this an enjoyable read. My favorite parts of this book were Flora's continual reference to and use of the books, Terrible Things Can Happen to You and The Criminal Element. The 14 Fibs of Gregory K by Greg Pincus -- I met this author four years ago at a KidLitCon in Washington DC. I have followed him ever since on social media, knowing he had a love of poetry. I was so happy to see how he infused poetry into this delightful text that should be a sure winner with students! Combine the ideas of not fitting in with your family (Gregory loves to write; his family are all mathematicians), not telling the truth and digging the hole of lies bigger and bigger, disappointing friends, and your best friend moving far away, and you get this wonderful book. I really like that the word "Fibs" in the title actually could have dual meanings. Teachers should definitely be book-talking this with their students! Navigating Early by Clare Vanderpool -- This is a lovely book, beautifully written. It is a story of two boys taking a journey that allows them to find themselves and gain a better understanding of family. It's good to be reading again! 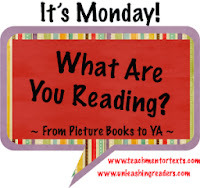 I can't wait to add to my growing booklist by reading what others have read this week. Head on over to Teach Mentor Texts for more posts. She was doing exactly what I was -- tying to ignore the enticing peer pressure of our smart friends. What I realize is that starting with Thanksgiving and moving through New Year, I mostly spend time taking care of those I love, and often times, neglect myself. So that's why I'm joining #nerdlution -- by participating and having the energy and support of those other participants, I stand a better chance of making sure I take care of myself as well. First, I plan to take care of my physical self each day -- whether that is walking, yoga, water aerobics, getting my hair done, a pedicure, meditating, or simply "legs up the wall" -- a great de-stressor! Second, I want to take care of my mental self -- I have not been reading as much lately and I know heading into the holidays that might be one of the first things to go when life gets hectic. I plan to read for at least 45 minutes each day. It's a small start in gaining some balance in my life. I know I am a much better person when I am mentally and physically in shape. Thanks to all of you for supporting me with these two #nerdlutions !! Once again, I am a day late to the party, but hopefully you will all understand as my celebration continued through yesterday evening, and this is the first opportunity I have had to sit down and process anything since returning home from NCTE late last Sunday evening. I have been immersed in the celebration of family since right after school on Tuesday evening, when I picked up our oldest daughter at the airport. Then, on Wednesday, the daughter who actually lives in the same town as us, came to the house with a huge duffle bag, prepared to stay for the rest of the weekend. What a celebration to have all four of us in the same "home" for a few days!! Our time together was spent in both traditional and non-traditional events. The girls and I put up holiday decorations together on Wednesday, followed by our annual pre-Thanksgiving movie. We saw "Catching Fire" at our local AMC theater, which is now sporting these amazing tilt-back chairs. Great chairs, great movie, great company!! Life was good. On the actual day of Thanksgiving, it was just the four of us enjoying the turkey with all its fixings. Because we knew this would be a tough Thanksgiving as we lost my father-in-law last February, we decided to throw in the very non-traditional excursion to the casino. The trip served its purpose perfectly -- after reflecting on stories about Dad T at dinner, the trip to the casino provided us with much hilarity. Friday, my extended family got together at my brother's home. Another wonderful turkey dinner surrounded by people I love. Then, one last holiday tradition remained when we returned home -- putting up the Christmas tree. I think it's one of my favorite traditions because the ornaments I buy each year for both of the girls or for our family have some type of significance for that particular calendar year. It is fun to reminisce about each of those events. Saturday, was a mixed blessing day. We love to watch football together and three of us did that (the other was actually at the OSU/Michigan game). Then, it came time to take our oldest, Kate, to the airport so she could wing her way back to her "other" home - DC. Knowing that I would see her again in about 3 weeks, made these good-byes a bit easier. I hope these past days were full of time with friends and/or family for all of you as well. For all the Celebrations, head to Ruth's blog to see this week's line-up.